Strong Resin for covering models with woven glass fibre cloth. Ideal for finishing on model aircraft. The Cured resin will accept all paints and is totally fuel proof once cured. Non shrink tack free glossy surface finish super low viscosity. Ideal for surface finishing on model Aircraft and Boats where a clear finish is required or alternatively the cured resin surface will accept all paints. Super low viscosity & clear. Bonds to most materials. Can be used in conjunction with Glass, Aramid / Kevlar® and Carbon Fibre. 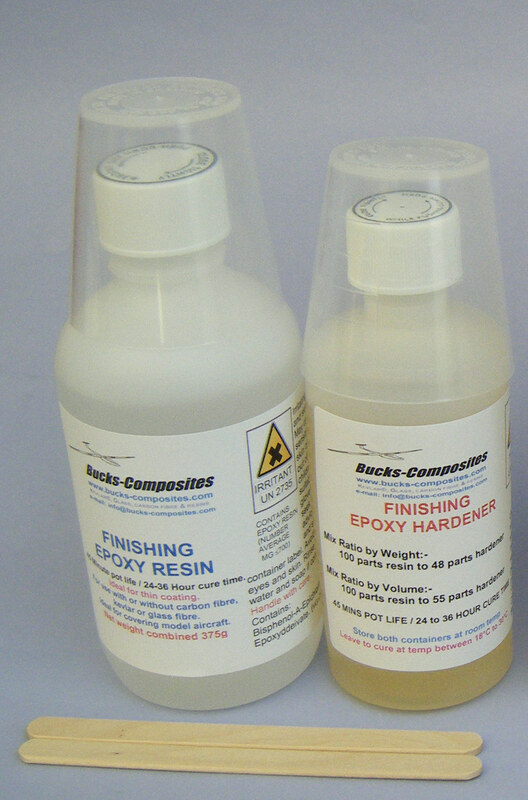 This epoxy resin will not attack foams, white, pink or blue. The resin and hardener pack comes with 2 mixing pots, 2 spatula's and instructions for covering a model aircraft wing and fuselage or model boat hull. Spare hardener can also be ordered. This Finishing Epoxy Resin and Hardener has a longer pot life and cure time and dries tack free and glossy over standard epoxy resin and Hardeners, standard epoxy resin and Hardener can dry with a waxy surface especially in damp conditions. The Finishing resin and Hardener can be used from start to finish when laminating, from sealing coat on wood, impregnating Aramid / Kevlar®, Glass fibre and Carbon fibre to applying final coat to fill the weave of the materials . Always leave the Epoxy Resin and Hardener in a warm area to cure for 36 hours and never turn the heating off during winter time while the curing is taking place. Can be heated up to 28°C to reduce the cure time.